Jason Honeychurch’s life can be broken into three distinct periods. Life before his traumatic accident at 9 years of age, the life he lived until he was 15, and the life he has lived since he was 15. Jason is 31 years old, lives in Adelaide (South Australia) and has lived his life as a right above-knee amputee since he was 15 years of age. Jason also works in the prosthetics industry, as a Prosthetic Technician, and will commence a Masters in Prosthetics and Orthotics in 2017. Jason also recently launched his own YouTube Channel and Facebook Page called ‘Limb Evolution’, where you can view videos of him doing every tasks such as walking and gardening as well as sports such as riding and running. ­Jason grew up Leonora which he describes as a town that is “an isolated one in the middle of Western Australia where Kalgoorlie, despite being 300 kilometres away, is the nearest big town”. It was in Leonora where Jason had a traumatic accident that would change his life forever. Being an industrial mining town Leonora’s “main drag” had huge trucks and cranes driving through each day. Jason had a BMX, his form of transportation, to play and get around town. Unfortunately, both forms of transportation traumatically collided when Jason was nine years old. “I had an accident in 1994 when a big industrial mobile crane came onto the foot path as I was riding my push bike. The red mobile crane flashed before my eyes and in that moment I landed under the wheels of the crane, resulting in my legs being crushed,” explained Jason. Jason was rushed to the small local hospital and, because of the extent of his injuries, then airlifted to Perth by the Royal Flying Doctors Service. “The doctors managed to save both of my legs, but my right leg was crushed beyond repair. I then spent the next six years in and out of Princess Margaret Hospital in Perth and had over 250 operations while doctors tried to save my right leg,” recounted Jason. While Jason’s left leg was functional, unfortunately his right leg was not. As a result of the accident, his right leg had lost a lot of skin, muscle and bone and his right knee was permanently fused. This meant that Jason couldn’t bend his leg and that it no longer grew. By the time Jason was 15 his right leg was 10 centimetres shorter than the left one, and he had to wear a 10 centimetre Ankle-Foot Orthosis (AFO) to balance his right and left leg so he could use crutches. “Because my right leg wouldn’t bend I couldn’t walk or sit easily, let alone run or ride a bike,” described Jason. When Jason was 15 the doctors gave him a choice to fix his leg discrepancy but not without many more operations and a lot more pain. “I was offered a ‘leg-lengthening procedure’ which, in my case, meant many pins stuck through skin and into my bone. I was also told that it would be an extremely painful procedure whereby the doctors purposefully break your leg with each turn of the pins until you stop growing,” expounded Jason. As the doctors anticipated that Jason would probably stop growing at 18, if he selected this procedure he faced another three years of painful hospitalisation. Not long after learning about this procedure Jason had a small fall on his leg which resulted in him “breaking the bones, excruciating pain and having a right leg that looked like spaghetti”. It was after this break that Jason said he came to his senses. “I thought more clearly about what the doctors were offering, thought about my future pathways and came to the conclusion that even more pain for a bone lengthening procedure that might not even be successful was not for me,” recounted Jason. “I realised that my leg was not a real leg. I had lost my leg the moment it was run over by the crane. I realised that my leg would never be the functional leg that my doctors envisioned it would be and knew in my heart that there had to be a better way. That’s when prosthetics entered my mind, and from that day forth I could see myself as an amputee wearing a prosthetic leg that would give me the functionality and mobility I had not had since I was nine,” recalled Jason. Prior to undergoing his amputation, and to ensure that Jason understood his decision, the hospital arranged for psychiatric assessments, discussions with physiotherapists and meetings with a few amputees. Jason met with three adult amputees prior to his surgery, an experience that made all the difference in his decision making. One particular amputee had a huge impact on Jason; a man who was an above-knee amputee, in his 30s, played sport, worked full-time and was in a relationship. “I was 15 and the one main worry that played on my mind was whether or not a girlfriend would ever want to go out with me if I had a missing leg. Well, that was all clarified when I met another above-knee amputee who, after we had met, introduced me to his beautiful long-term girlfriend who not only kissed him but touched him on his prosthesis,” explained Jason. “It was at that point I knew that becoming an amputee would not only benefit me physically but that it wouldn’t stop me from having a girlfriend, something very important to an impressionable male teenager,” laughed Jason. So at the age of 15, and with the full support of his parents and family, Jason underwent an above-knee amputation. “The first thing I remember saying to my Mum after my surgery was “Is my leg gone?” and after Mum said “Yes” apparently I went back to sleep with a smile on my face,” said Jason. Much changed within the six weeks after Jason’s amputation. “I was fitted with my first prosthesis and started in Year 10 at Aquinas College, a boarding school in Perth that my older brother already attended,” stated Jason. Aquinas College is an all-male school with over 1,000 students and a long history steeped in both academic and sporting achievement. “Attending Aquinas College really helped me to quickly adapt. Suddenly I had to walk up and down, I had to go up four flights of stairs just to get to my math class, I began playing sport for the first time since I was nine and I had an older brother with me who wouldn’t let me lag behind him. I had to adjust and stand up for myself very quickly and, while I hated it at times, I now realise it helped me to become the resilient person that I am today,” explained Jason. Three particular events occurred whilst Jason was at his boarding school – work experience, discovering a passion for rowing and falling in love with his first girlfriend. After his amputation Jason began seeing Andrew Vearing, his first prosthetist. Andrew not only made his first prosthesis but was a trusted professional who made Jason “feel special, full of potential and could see a budding young interest in prosthetics”. Andrew provided Jason with work experience opportunities in Years 10, 11 and 12; experiences that allowed Jason to see first-hand the “amazing impact that Andrew had on patients, and just how much respect he was held in the eyes of colleagues and patients alike”. After the work experience opportunities with Andrew Vearing, Jason then knew he also wanted to work in the prosthetics field and upon finishing school Andrew employed Jason as a Prosthetic Technician. The second significant event that took place whilst still at school was that Jason discovered a passion and skill for rowing. “At Aquinas College all students, including me, were expected to take part in sports. I chose rowing and learned that I not only enjoyed it but that I was good at it,” revealed Jason. In Year 12, Aquinas College took part in the prestigious ‘Head of the River’ school rowing competition with Jason one of the four oarsmen selected to represent the school. “Head of the River is a well-known historical event in Perth which draws many spectators and media attention, and I couldn’t believe it when a photo of my team was on the front page of The West Australian newspaper the day prior,” recounted Jason. The newspaper article discussed Jason’s team, but paid particular attention to the fact that a young amputee would be representing his school. “After the article, people drove miles to come and see us race and I had heaps of strangers approach me afterwards to shake my hand and congratulate me on being the first amputee to partake. I couldn’t believe it, it was like I was a celebrity,” revealed Jason. Indeed Jason was also thrilled to be awarded with the ‘Best Oarsman Award’ after the race, a recognition that “completely floored” him. The third event experienced during Jason’s secondary schooling years was meeting his very first girlfriend. “I used to love dancing and I always thought I would meet my first girlfriend on the dancefloor and, in fact, that’s what happened,” said Jason. At a school formal Jason met the young woman who would be his girlfriend for a couple of years. “I met her on the dancefloor wearing long pants, so she didn’t realise I was an amputee. We started chatting on the phone at night, which incidentally was a big achievement at a boy’s boarding school, and I still wasn’t sure how to bring up the ‘amputee thing’,” explained Jason. 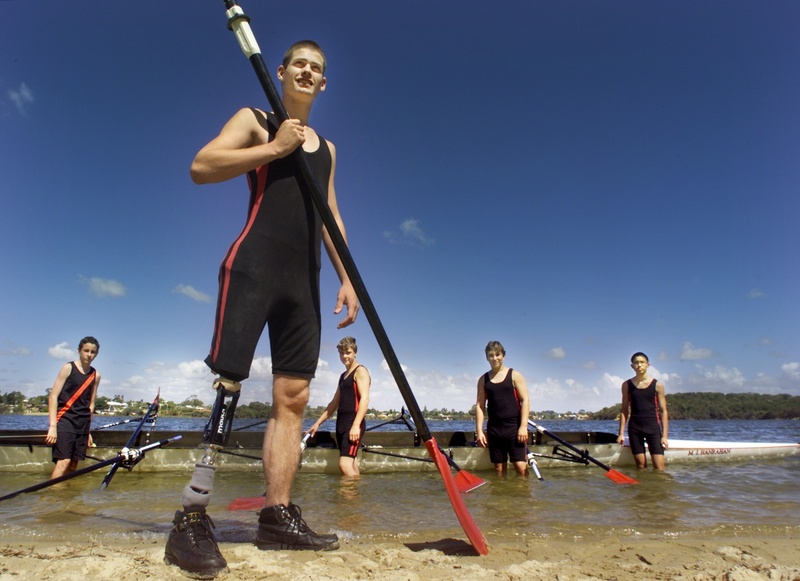 However that was all resolved when Jason featured on the front page of The West Australian newspaper for rowing, after which his girlfriend called him and said that she was so proud of his achievements and that being an amputee made no difference to her. “I was overcome by my girlfriend’s positive reaction to my limb loss, and I could then focus on the other normal things that worry teenagers when starting relationships,” disclosed Jason. After leaving school Jason was privileged to be mentored and supported by Andrew Vearing in his first role as a Prosthetic Technician. Jason was also supported by Andrew to “pick up stumps” and move to Adelaide to continue working as a Prosthetic Technician. Initially, Jason worked at Northern Prosthetics which was followed by a move to Prostek, where he has now worked for ten years. It was also during this time that Jason completed a Bachelor of Health Sciences at Flinders University. “When I turned 24 I decided that I wanted a tertiary education in the health sciences area. With the support of Prostek’s owner, Wayne Bowker, I was able to attend Flinders University part-time and also continue working part-time at Prostek. It was an extremely gruelling few years, but without the support of Prostek I wouldn’t have gotten through it and I can’t thank Wayne enough for that opportunity,” extolled Jason. 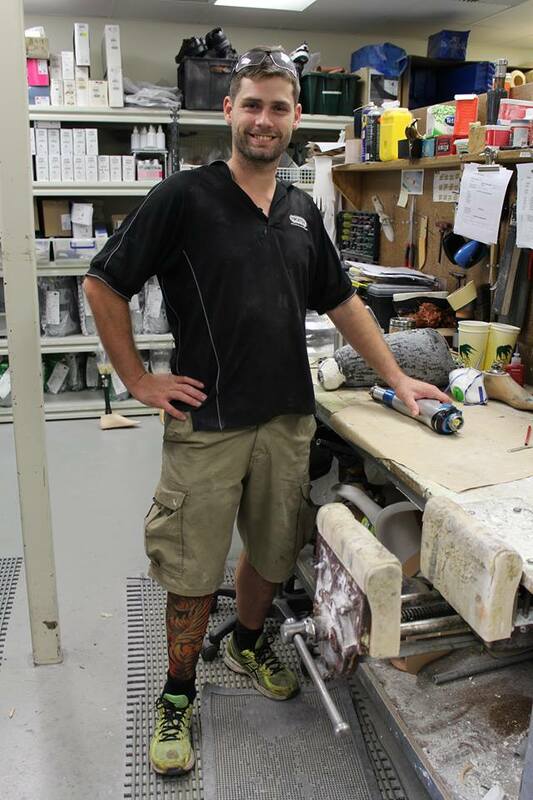 As a Prosthetic Technician, Jason feels “privileged” to work alongside talented colleagues and support prosthetic-using amputees to achieve their goals. Jason thoroughly enjoys assisting children and adults to receive the prosthesis designed by their Prosthetist, and is particularly thrilled when he is able to work alongside patients to create colourful prostheses that reflect the individual’s personality. “Working with kids is great because their imagination really does go wild, and I love being able to help them incorporate fabrics of their favourite superhero or cartoon character into their socket design,” enthused Jason. To protect his own prosthesis at work Jason wears a fabric tattoo arm-sleeve over the top, as this acts as a protective barrier against all the dust in the workroom. This cover has also been the source of some interesting and informative discussions in the community. “I was recently in the supermarket, wearing shorts and the tattoo arm-sleeve over my prosthetic leg, when a heavily tattooed man came up to me to compliment me on my tattoo and enquire as to how much my full-leg tattoo cost. I grinned and said it cost $3 to the now bemused bloke. I then explained it was over the top of my prosthesis and spent a while discussing amputation and prosthetics to a very inquisitive and now more aware member of the community,” laughed Jason. Jason has seen significant advances in prosthetics since his amputation in 2000. Initially Jason was issued with a safety knee which was very basic, and heavy. He would have to put weight onto the safety knee for it to lock. This leg didn’t have a gel-liner with a pin-lock which meant Jason had to wear thick woollen socks with leather straps that went around his waist and over his shoulder to secure the leg, something that “was very painful, heavy to wear, hot and didn’t allow for comfortable walking”. 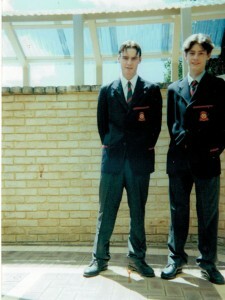 In the years after his amputation gel and silicon liners were introduced, and it was only a few years after his amputation that Jason was able to move to wearing a more advanced legs with a computerised knee unit that allows him even more mobility and abilities. “I also have an amazing carbon fibre running blade that has allowed me to ‘run like the wind’ and train for the 100m sprint and run a personal best of 17 seconds in the Brisbane Nationals in 2015,” explained Jason. Jason enthused that “the advances in prosthetics have been amazing to witness over the years and I’m so glad to see children and adults now being able to access much more functional and comfortable prostheses”. Since first meeting Andrew Vearing, Jason always thought his eventual career would be as a qualified Australian Prosthetist. Jason was recently accepted into the Masters of Prosthetics and Orthotics program at La Trobe University (Melbourne) and will commence his studies in 2017. “I am thrilled that I will be able to achieve my ultimate career goal and be able to work as a clinician supporting child and adult amputees. I really hope that the academic studies, practical experience and my own personal experience will assist me to become a well-respected and patient-centred Prosthetist in the future,” said Jason. Speaking from personal experience Jason believes that “specialised support and information is fundamental for children with limb differences and their families, as support plays a major part in accepting, learning and growing to live with a limb difference”. Jason admits to feeling a little isolated when he was a teenager, but now realises that some of his school peers were nervous talking about his amputation because they were worried they would upset him. “It was only later that I discovered that it was my responsibility to take the initiative to approach others and make them feel comfortable with the fact that I had a limb difference because, after that, then the barrier was down for all of us,” explained Jason. For these reasons Jason recently launched his own YouTube Channel and Facebook Page called ‘Limb Evolution’, a visual representation of his own progresses and new abilities­­­. Jason shares his story and passion for prosthetics through videos commencing with him taking his first steps with the aid of a prosthesis, to his thirteen years of experience as a Prosthetics Technician. Jason established these pages as he felt that many people with limb differences might benefit practically, physically and morally from seeing his journey and witness just what a person with limb difference can be or do. To subscribe to his channels and receive updates on his latest videos, just type ‘Limb Evolution’ in YouTube and subscribe or like his Facebook Page. Jason’s final advice to children and young people living with any type of limb difference is the motto that he lives by. “Follow your dreams and believe in your vision, believe in you and seek support, support people around you, never give up, and use your limb difference as a strength, not a weakness”. Limbs 4 Life thanks Jason for sharing his story and for being one of our very committed Peer Support Volunteers. Limbs 4 Life also wishes Jason all the best with his upcoming studies and looks forward to working alongside him as an industry peer. We also thank The West Australian newspaper for kindly providing the photo of Jason prepared for rowing in ‘Head of the River.